BAD NEWS ON THE DEVIL FRONT. HIS ANKLES GAVE OUT UNDER THE MASSIVE WEIGHT AND PRESSURE OF HIS BEER-GUT ON SATURDAY NIGHT. 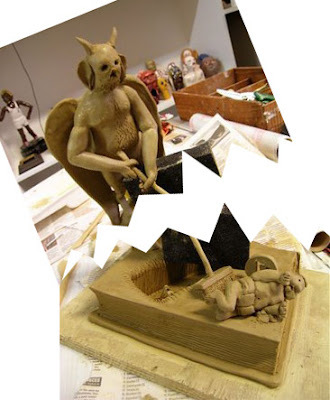 SOME OF IT IS SALVAGEABLE BUT I'LL NEED TO STREAMLINE THE DEVIL SO THE WEIGHT IS ON HIS WINGS AND TAIL.